If you want to keep abreast with the latest developments (such as when the next book will be available, which I know a lot of you are asking) then the simplest way is to subscribe to the humanlegion.com website — there’s a button to do that on the side of each webpage. Subscribers get each post sent to them automatically via email. Alternatively, if you have an account on amazon.com, you can go to my author page and ‘Follow’ me. My amazon.com author page is here, and the follow button is under my mugshot. This is a fairly new facility on the US Amazon store only, but for readers elsewhere in the world, you don’t have to buy from the US to have an account on amazon.com. I follow and subscribe to all sorts of things myself. Plus a lot of people want to contact me. The result is that I get so many emails that I don’t always spot the ones I’m waiting for. 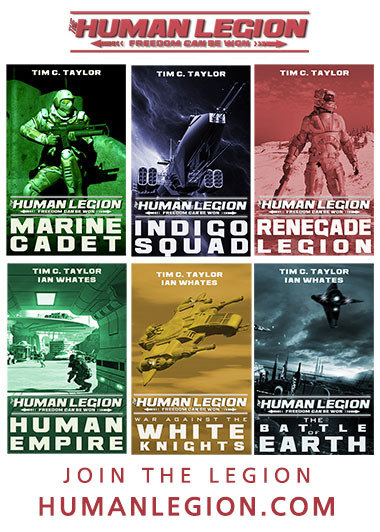 I’ve had half a mind to set up a Human Legion Facebook page, though I’m reluctant to set up too many places in cyberspace, especially considering I’m looking into collaborating on a military SF/ space opera web forum with Chris Nuttall. Would anyone be interested in a Human Legion Facebook page as a means of keeping up to date and chatting? We’re in the final stretches of writing the fifth book now. It’s been fun writing about scour-copters, aerial artillery, combat engineers, human irregulars, White Knight soldiers, and a raiding party sent deep inside a gas giant. The hardest battles, though, are fought between our human characters. <Sigh>. I wish they could all sit down and hug out their differences over a nice cup of tea and a biscuit, but… well, that would be boring. Getting shot for details huh? We talking flesh wound? Head shot? Center mass but I’m wearing body armor? Let’s negotiate here……. Getting shot? I meant that metaphorically. What you would actually experience is half a million, highly radioactive lazy dogs released from the upper atmosphere. Sorry, JRH, but your lawn would buy it too. But then, this would be a serious security breach.